I don’t know about you, but I’m truly tired of bad news and negative thinking. So here’s a little bit of positive action I took recently, something that made me happy to do. It cost me a little over $10 and a few minutes of my time. It was my way of thanking some people who recently stood up for our human rights when they really didn’t have to – and who stood up even though they knew that standing up would be very costly. Did you hear about the whole brouhaha that surrounded the Eastern Sports and Outdoors Show, the one that was supposed to happen this week in Pennsylvania? That show has been cancelled. It was cancelled because the company that usually puts on the show, Reed Exhibitions,* very abruptly and unilaterally decided that there would be none of those icky AR15-style personal defense weapons allowed at their show. Reed Exhibitions apparently believed that they could drive a dividing line between hunters and other gun owners. Reed thought the outdoors people would throw the rest of us under the bus. Instead, the outdoors community stepped up and stood up for our rights. Nearly 20% of the show’s exhibitors, and the majority of its major sponsors, cancelled their booths and decided to stay home. This includes some of the biggest names in the field, including Cabela’s and Outdoor Channel. But it also included many small companies, people for whom this one show represents the bulk of their paycheck for the entire year. 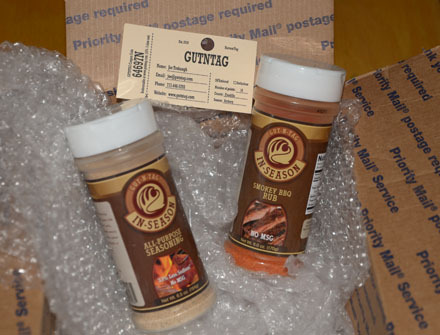 Two spices from GUTNTAG: an all-purpose spice and a smoky BBQ rub. Both yummy! When I saw that, I wondered, What can I do about this? I’m just one person, just one voice. Whatever. Then I realized that even though I can’t do everything, I can sure as heck do something. With that thought in mind, I went poking around online until I found a list of companies that had pulled out of the show before it was cancelled. Almost at random, I pulled up a few of the names on the list and searched for the company websites. When I found a small company that looked good to me, I ordered something I could use. I’m going to keep that list handy for future use, too, because it makes me happy to help businesses that care about human rights. Oh, and the spices I ordered? They’re really good! Based on a quick sample of the products, I can recommend GUTNTAG as a good source for yummy spices. You can find the full list of companies that supported our rights here. * Yes, Reed Exhibitions is the same company that usually puts on the SHOT Show on behalf of the NSSF. It seems unlikely they will be doing so in future. Looks like the folks who run Reed didn’t remember Smith & Wesson’s booboo.